When considering solar for your organization, it's logical to want to know about system maintenance. Modern solar panels are very durable with operational lives measured in decades. The good news is that maintenance is fairly minimal if done regularly, but consistency is definitely the key. To ensure that your system is always operating at peak efficiency, we recommend you hire a credentialed solar operations and maintenance (O&M) team to take care of your investment, whether that's just regular cleanings and system check-ups, or a more comprehensive maintenance and repair program. 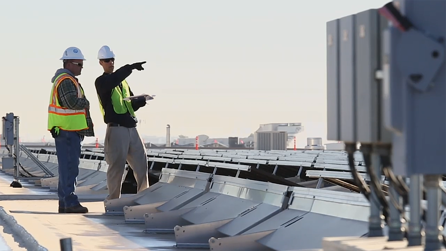 Commercial solar energy installations are complicated systems, with tens of thousands of interconnections contributing to overall system performance. A good O&M program will ensure every aspect of the solar ecosystem is watched and brought back into spec when needed. Outlining every aspect of a comprehensive O&M program would be far too lengthy to complete in a short blog post. With that said, below are some common questions we receive about commercial O&M to help you understand the importance of maintaining your organization's solar energy system. What, exactly, is commercial solar O&M? Solar O&M usually falls into three categories: monitoring, preventative maintenance, and repairs. Monitoring: Although solar is typically a low-maintenance technology, it can be beneficial to have monitoring available to ensure that the system's many panels and interconnections are always working together as intended. Most O&M service providers offer remote monitoring packages that can help spot performance issues, repairs, or even unexpected system outages as quickly as possible. Preventative maintenance: As with any technology, pre-emptive care and maintenance will ensure your solar energy system's longevity and efficiency. Preventative maintenance is the best way to avoid costly repairs and system outages due to equipment issues. Panel cleaning and annual equipment inspections fall under this category. Reactive Maintenance: Even the best kept solar energy systems might need repairs from time to time. Troubleshooting, diagnostics, manufacturer warranty repairs, replacements, and upgrades might be needed to keep your solar energy system operating at ideal levels. Why is ongoing O&M important? Going solar is a sizable investment your organization can reap the benefits from for decades. Because of the significant amount of time your solar energy system will be working for you, routine maintenance and checkups will improve ROI by ensuring efficiency and expanding the system's operational lifespan. Without monitoring, you may not know that your system is down or that components are malfunctioning. Why wouldn't you want the security of a qualified O&M team to help you with such a large investment? How much does commercial solar O&M cost? The cost of O&M can vary greatly depending on number of factors. The proximity to your O&M provider, system size, and type are the biggest factors that will determine your overall cost of maintenance. For example, a large solar carport system 100 miles away from your O&M provider will most likely cost you more for O&M services than a smaller rooftop array 15 miles away. This is because a solar carport is harder to access than a rooftop (it might require scissor lifts or other equipment), a larger system will generally require more resources to maintain, and there is more distance to account for when dispatching an O&M team. What should I look for in a commercial solar O&M provider? Not all O&M providers are created equally, and the level of service you choose will depend on your budget and needs. At the base level, your O&M provider should cover monitoring and performance alerts and preventative maintenance, like inspections. You'll also want a competent team who can handle escalations of issues quickly and will respond to you promptly. Time is money when it comes to your solar energy system being down, so having a responsive O&M provider is key. If you're installing solar in multiple locations, using an O&M company that can service all of your locations can be important. If you're dealing with a specific kind of equipment, hiring an O&M team that is experienced and knows how to properly work on it can also be beneficial. Be sure to cover these items when talking to an O&M team to ensure the best care for your solar investment. Our O&M experience is extensive and encompasses a broad selection of services from routine preventative maintenance, to pro-active monitoring of system performance and health. Regardless of size or type – even if we didn’t originally install it – our team of O&M experts can develop a customized plan for your organization, or offer one of our standardized plans to best suit your needs. Whatever option you choose, you’ll join a growing family of world class companies that depend on Sun Valley Solar Solutions every day.